Rajnath pays tribute to martyred jawans. HomeCRIMERajnath pays tribute to martyred jawans. 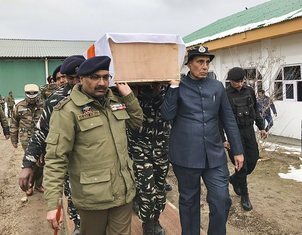 Home Minister Rajnath Singh turned a pallbearer Friday as the bodies of 40 paramilitary personnel killed in an audacious terror strike in South Kashmir's Pulwama district were sent on their last journey to home.Singh, accompanied by a high-level team comprising officials from the CRPF, NIA and Home Ministry, arrived here on Friday afternoon and drove straight to the adjacent CRPF campus where a wreath laying ceremony was held for the slain jawans. As the bugler played the 'last post' and guard called for 'shok salami shastra' , a two-minute silence was observed after which the Union home minister gave a shoulder to the coffin of a jawan which was being taken to his native place in a special aircraft.The home minister, Governor Saty Pal Malik, Home Secretary Rajiv Gauba, CRPF Director General R R Bhatnagar, Jammu and Kashmir DGP Dilbagh Singh besides others attended the wreath laying ceremony. "The nation will not forget the supreme sacrifice of our brave CRPF jawans. I have paid my last respects to the martyrs of Pulwama. The sacrifice will not go in vain," homeminister said.The dignitaries stood in silence, till the coffins were loaded in a truck which went to the Srinagar airport. As many as 40 CRPF personnel were killed, and five were injured on Thursday in one of the deadliest terror attacks in Jammu and Kashmir ,when a Jaish-e-Mohammad suicide bomber rammed a vehicle carrying over 100 kg of explosives into their bus in Pulwama district. The bus was part of a convoy of 78 vehicles of the CRPF travelling from Jammu to Srinagar. Prime Minister Narendra Modi on Friday said, those responsible for the attack will pay "a very heavy price" and security forces will be given a free hand to deal with terrorists.